A five-year visual journey on life through the eyes of Author/Illustrator Nikkolas Smith. Nikkolas Smith, a native of Houston, Texas, is a Master of Architecture recipient from Hampton University, current Theme Park Designer & Concept artist at Walt Disney Imagineering, and Children's Books Author/ Film Illustrator . He is the author/illustrator of the picture books "The Golden Girls of Rio" (nominated for an NAACP Image Award) and My Hair Is Poofy And That's Okay. He also creates activist art paintings and Hollywood movie posters (Black Panther, Southside With You, Dear White People, Stranger Fruit). He is a proud 2016 White House Innovators of Color fellow. His latest book Sunday Sketch: The Art of Nikkolas is a visual journey on life, a collection of more than 100 sketches he has done in the last five years. His works have been featured on TIME Magazine, The New York Times, The Washington Post, CNN, Buzzfeed, the Academy of Motion Pictures, The Guardian, ABC, NBC, KCET and many more. His art has been shared on social media by Van Jones, Shaun King, Viola Davis, Colin Kaepernick, Rihanna, Erykah Badu, Lupita Nyong'o, Kendrick Lamar, Tracee Ellis Ross, Ava Duvernay, Common, Simon Biles, Tessa Thompson, Mark Ruffalo, Jesse Williams, Amy Shumer and many others. He is a proud 2016 White House Innovators of Color fellow. His latest book Sunday Sketch: The Art of Nikkolas is a visual journey on life, a collection of more than 100 sketches he has done in the last five years. 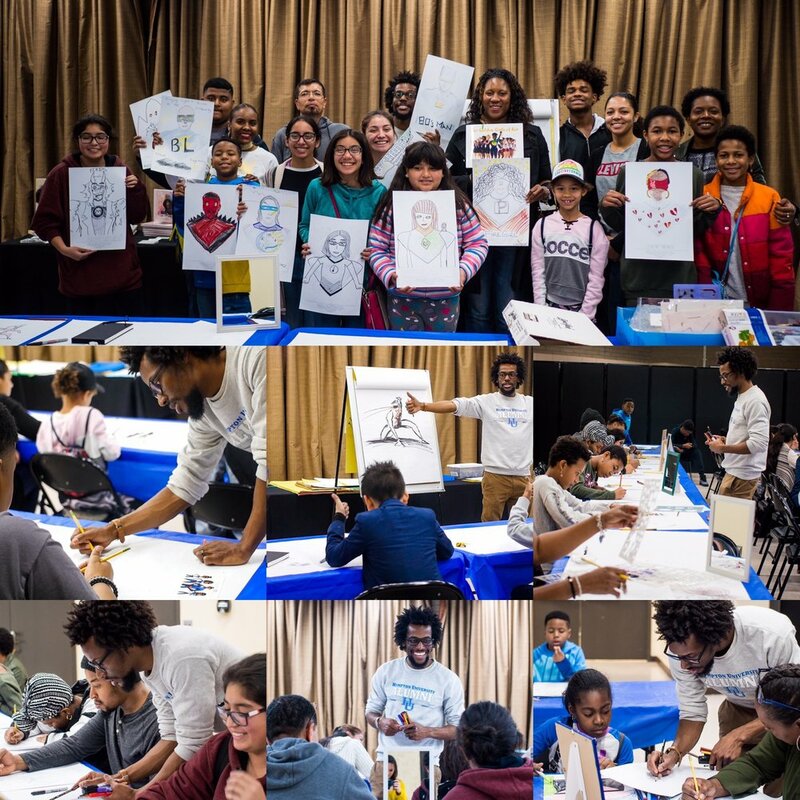 Nikkolas also talks for conferences (TEDxWatts) and schools all over the country, leads workshops in digital painting and movie poster design, and after hours on Saturdays mentors kids in Compton & Watts, CA, giving art lessons and life skills for success. He lives in Los Angeles, California. Schedule a NIKKOLAS digital or traditional painting workshop for your organization, school, university or district or for your personal event! Depending on the age, grade, number and background of the participants and the specific subjects, workshops can be customized. NIKKOLAS workshops emphasize hands-on/technical learning. The facilitator uses his experience (lecture style and technical details) as well as an interactive approach to provide participants with a background on the basic concepts and methods for painting. Participants spend most of the workshop session engaged in hands-on activities. For universities and colleges the digital workshops can also be offered online.